@The Real Grim Reaper, this may very well be the sheet music for that song. @The Real Grim Reaper, I had fixed that before you responded (on my screen), now I’m torn on whether I should change it back to make your response relevant. 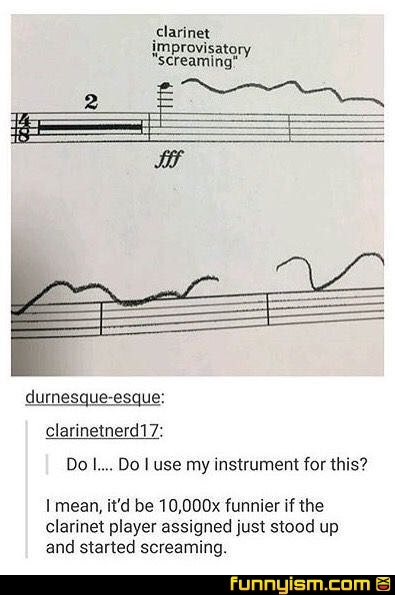 As a clarinet player, I can confirm it would be hilarious. 4'33'' and The Rite of Spring are some neat pieces. Squidwards’ playing would qualify for this part. What the fck do you mean "I mean"!! @UglyOldGuy, I dont know why honestly. One reason, and that's my reason why I use it a lot, is because English is not my first language and it just feels better than starting a sentence without it. Also it implies that it's just an opinion. Why do people preface what they mean by saying "I mean"?